Admit it, you are ready for the holidays and all of the precious family time that goes along with it. This time of year is the best for creating memories and feelings of family togetherness. It all sounds fantastic when you think about getting the whole family together for Christmas. Picture it, children laughing, playing in the living room, the old guys falling asleep on the couch and you, stuck in the kitchen, wrestling with a turkey big enough to feed everyone. It seems like a great idea, until you think of all of the work it is to create such a fantastic meal. So why not leave it to Vancouver’s best Christmas catering company, A Catered Affair? Freshly sliced, roasted, whole, grade AAA turkey served with homestyle sage infused stuffing. 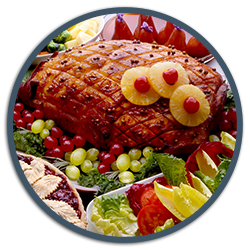 Honey glazed and clove infused baked old-fashioned ham. Doesn’t that sound good? Of course it does! At the same time it sounds like a extraordinary amount of work. At A Catered Affair we want to be your Christmas caterer. We want you to be the one dozing on the couch, enjoying the children and making memories. We can set up wherever you wish! We can even provide you with tables and linens if you would like. Please take a look at our elegant winter and Christmas menu and call today to ensure your reservation.